Five New Brunswick communities—St. Stephen, St. Andrews, St. George, Blacks Harbour and Grand Manan—are actively preparing for sea-level rise and storm surge. With facilitation help from the St Croix Estuary Project and Eastern Charlotte Waterways, working groups of community members have identified which regions and members of their community are most vulnerable to flooding. Over several months, each community held five facilitated sessions focused on infrastructure, socio-economics, environment, governance and options. 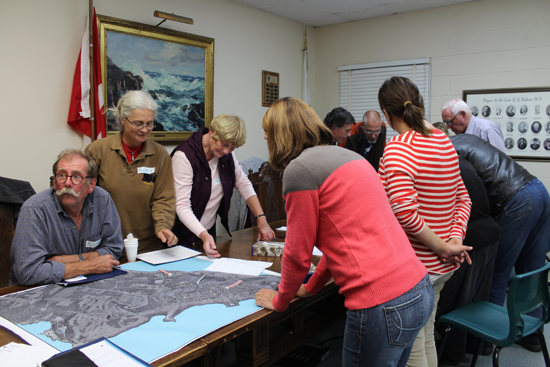 “Our climate change meetings were a combination of excellent, science-based presentations on the town’s sea level rise and storm water issues, coupled with citizen engagement, discussion and recommendations,” observes Stan Choptiany, Mayor of Saint Andrews. Support for the project came from Environment Canada (through its Atlantic Ecosystem and Science Horizons Initiatives); the Province of New Brunswick’s Environmental Trust Fund; and the Intact Foundation.